"This book could not be more timely as immigration becomes the issue that could break the European Union and border anxieties pervade the world of states. 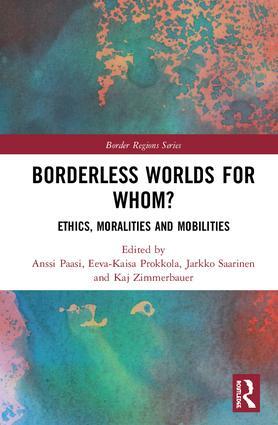 The book focuses on the neglected ethical dilemmas of borders: from the ways migrants are categorized as refugees and ‘economic’ migrants, for example, to the fact that tourism, one of the world's major industries by value-added, depends on easy border crossing even as others are excluded, and the idea of a world without borders as being necessarily more just than the one we presently have. If populist politicians would read more, including this book, they might rant less and reason more." Anssi Paasi is Professor of Geography at the University of Oulu, Finland, and the Director of the RELATE Center of Excellence (Academy of Finland). Eeva-Kaisa Prokkola is Senior Research Fellow at the Geography Research Unit, University of Oulu, Finland, and a Docent in Human Geography and Border Studies at the University of Eastern Finland. Jarkko Saarinen is Professor of Geography in the University of Oulu, Finland, and Distinguished Visiting Professor (Sustainability Management) at the University of Johannesburg, South Africa. Kaj Zimmerbauer is Docent at the University of Oulu, Finland, and Scientific Coordinator in the RELATE Center of Excellence (Academy of Finland).